There are several route options leading from Hahlić towards Platak, and these routes partially overlap. Therefore, hikers should have a map of the area with them. It takes 3 to 4 hours of hiking to get from Hahlić to Platak. This section is part of the Rijeka Hiking Tour (Riječka planinarska obilaznica, RPO). In the hinterland of Rijeka, the Blue Line of Via Dinarica descends from Platak towards Kamenjak and further to the bridge Krčki most, where Via Dinarica crosses to the island of Krk. 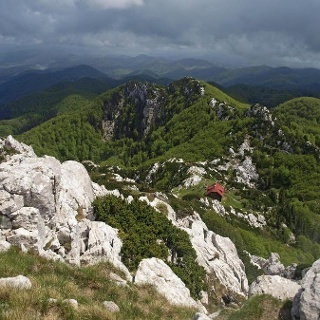 In the area below Platak, there are many relatively low peaks rising from the slope that descends from the littoral edge of the mountainous region of Gorski kotar towards the sea. These peaks represent great and accessible viewpoints, since they are bare at the top. The area is crisscrossed by old military paths (mulatijere or "mule tracks"), and it is full of bunkers, trenches and artillery positions along the so-called Rupnik Line that the Kingdom of Yugoslavia had built along the then Italian border. With its views and wonderful nature, the most attractive site by far is Kamenjak, rising east of Grobničko polje. In the area above the bay of Bakarski zaljev, there are many other relatively low but interesting peaks – worth mentioning are Suhi vrh, Ljubibelj, Svib, Velika Lakovica and Mala Lakovica. There are many available paths in good condition in this area; however, orientation may be challenging due to numerous intersections and complex relief. The route of Via Dinarica descends to Bakarski zaljev and proceeds towards Krčki most. A spacious elevated area between Obruč and Platak is relatively little known, since it has no mountain huts or renowned destinations, nor settlements at the foothills, or traditional paths leading from the settlements to the mountain. However, the area is worth visiting for the wide views that it offers, as well as for beautiful meadows and hidden forests still preserving the charm of unexplored nature. Since there is no strict boundary on the eastern side, this area represents the wider surroundings of Platak, given the fact that all the main access routes are oriented towards Platak and that the trail Kripanjski put begins from the road leading to Platak. In addition to Crni vrh, the most pronounced peaks in this area are Sleme, Grleš, Gornik, Primorski Klek, Kuk, Bela Peša and Jasenovica. This area is separated from the western part of the Obruč group and from the area around Hahlić by the deep canyon of Mudna dol – one of the most picturesque torrential canyons in Croatia. Platak is a well known excursion destination of the inhabitants of Rijeka, with a diverse tourist offer, and the entire area has a strong littoral character.